Arts, cultural and scientific organizations provide essential opportunities for lifelong learning and creative exploration. Outreach to school children reached 4.3 million contacts in 2017. This was an 8.5% increase over 2015 and the second highest number reported by CBCA in the history of this study. These opportunities include arts integration in classrooms, subsidized school field trips and performances at under-served schools. On average, school children in the metro area received eight arts experiences in the year. In addition to partnerships with schools, arts organizations are providing a wide variety of opportunities for youth and adults to engage with the arts through lessons and educational training. Total class enrollment reached 683,545 in 2017, a 35% increase over 2015. Research continues to demonstrate the value of arts participation for children and adults alike. Organizations like Swallow Hill are demonstrating the impact of both school outreach and classes for all ages. Swallow Hill’s mission is to bring the joy of music to life every day. They are the country’s second largest acoustic music school, providing more than 20,000 private lessons and 1,200 group classes annually with students of all ages. Of the 70,000 visits to their music school last year, 80% were adults looking to learn a new instrument or hone their skills. They also bring music education and experiences to our under-resourced communities through the Little Swallows early childhood education music program, K-12 assemblies and enrichment programs, and Music Therapy programs. They partner with organizations like the Children’s Museum of Denver at Marisco Campus, Brent’s Place, Continuum Colorado, the Alzheimer’s Association and 50 schools across the community. Swallow Hill is the only organization providing formal music education in Denver’s low-income preschools. 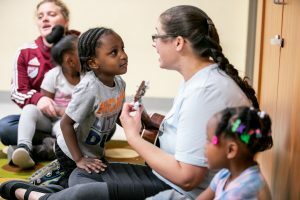 Their Little Swallows program introduces three- and four-year-olds to the world of music-making through a general music curriculum filled with songs, creative movement, rhymes, percussion instruments, and other activities. Watch a video about Little Swallows. Swallow Hill is also a concert promoter, bringing more than 250 concerts to the metro area and bringing together more than 80,000 music lovers each year. More than half of those shows are featuring homegrown, local talent. In addition, they partner with and produce music at the Denver Botanic Gardens summer concert series in addition to concerts at the Clyfford Still Museum, Four Mile Historic Park and Commons Park. Among Swallow Hill’s nearly 100 employees, all of their 70 instructors are also actively working musicians in the community, performing in bars, cafés and venues across our region, producing songs and albums and adding to the rich cultural fabric of our community. All of this helps to sustain and grow our region’s creative class and adding opportunities for adults and youth to learn music and listen to music each and every day. Swallow Hill is committed to growing their community outreach programs and bringing all of the benefits of music education to preschoolers across the metro area. In 2017, their Little Swallows program was taking place in four classrooms serving 65 kids. In 2018, Little Swallows has found a home in more than 80 classrooms impacting the lives of more than 1,200 kids – all in schools and centers that have Free and Reduced Lunch rates of 90% or higher. In 2019, they plan to grow at a more modest pace, adding an additional 30 classrooms and bringing nearly 500 more kids into the Swallow Hill family. Their sights are set on providing music education to those who wouldn’t have the opportunity otherwise. Together, they’re bringing the joy of music to life every day. Educational opportunities are vital to ensuring future generations of cultural consumers, arts advocates and creative professionals. There are also myriad benefits to exposing young children to the arts and providing opportunities for people of all ages to express themselves.